First of all, almost every machine in this racing game is named after Konami classic games! 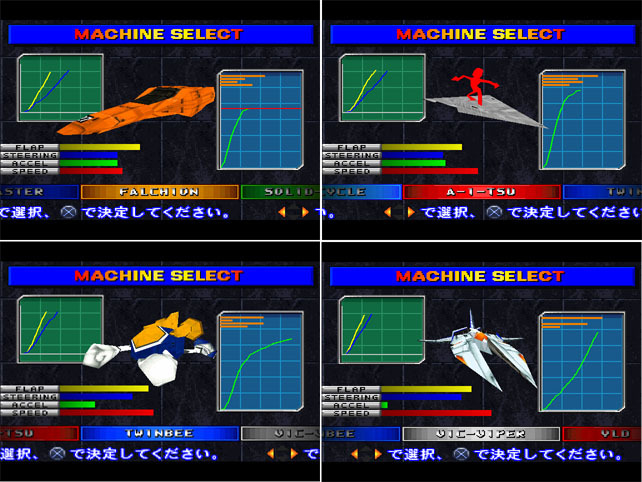 Those machines are available at the start, there are 4 more machines which can be obtained by beating them in 'Battle CPU' mode. And there's more, which is the today's meat. After you got the secret machines above, challenge the battle again with one of four secret machines. It will give you some new challengers. These four machines are 'the real things', not just normal cars with 'classic' name. Yes,you can drive in the Neo Kobe city with our favorite hyperspace fighter or a stickman on paperplane. Which sounds quite cool and those four machines even have their own music, which is a remix of the songs in their original games. Falchion, Aitsu, Twinbee,and Vic Viper. 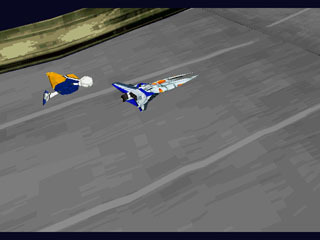 Vic Viper battling against Twinbee in Neo Kobe City! The main problem is THIS GAME IS AS HARD AS HELL. You NEED to control your fastest machine as accurate as a computer to beat them and even that won't assure your victory. The CPU opponents are insanely fast and you have to beat them with machines which have inferior speed to opponents' cars. I had to use save states to beat them, loading states until I make perfect turn / block the enemy car coming from behind successfully. Unlocking Vic Viper takes is a lot of pain - You'll need at least the Try-Cycle car to keep it in your sight. Even after you unlock Vic Viper, driving with it is painful since it is too fast to control. It runs at over 460km/h, while the other cars running at about 300km/h. Low acceleration of Vic Viper is actually not a flaw-it would be totally uncontrollable if it had high acceleration. If you want to enjoy driving with Vic Viper, please stay away with this one. Konami Wai Wai Racing Advance is much better choice to enjoy.